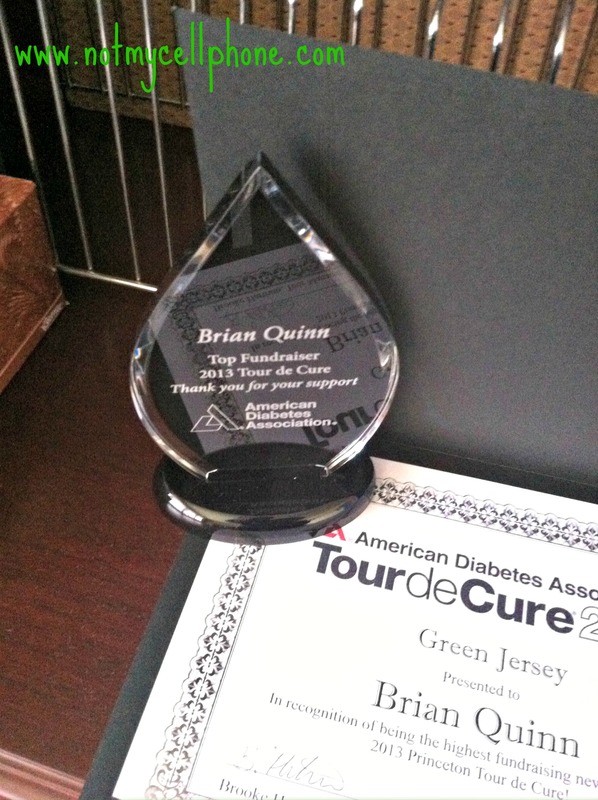 A few weeks back I was honored at the ADA Tour de Cure Champions dinner as one of the top fundraisers for the Princeton Tour de Cure. Which I have to say was quite humbling and awesome at the same time. I received the Green Jersey or will get it at some point. This jersey signifies the top new fundraiser to the tour. My total of $6700 or so crushed the second top new comer by alot! Woo. 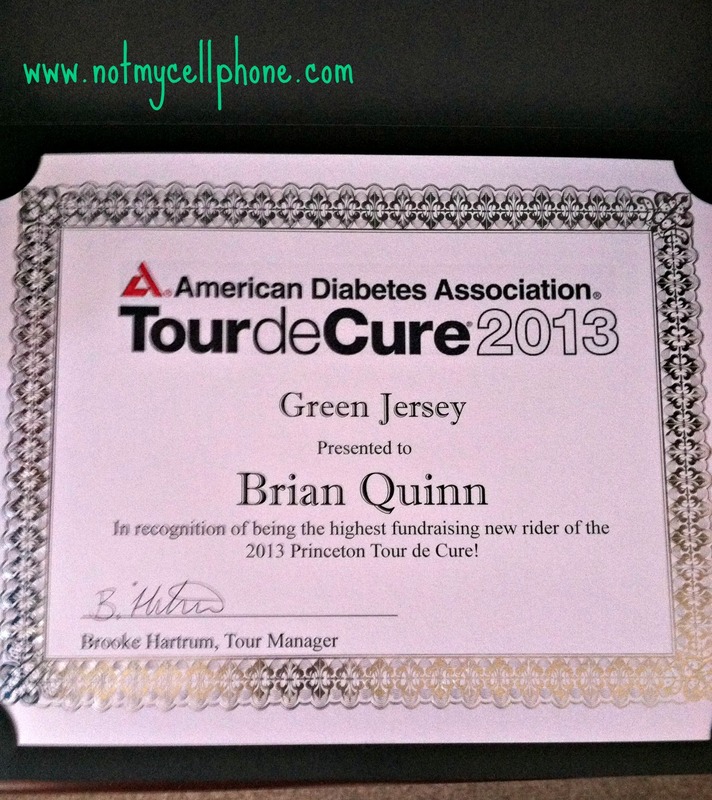 So I was awarded the green jersey. The coveted gold jersey sadly went to someone else who was the top fund raiser on the tour. I lost to him by about $400. Which is pretty cool, showing that I was so close. I really thought I had it in the bag, but in the end I lost to him because of matching gifts. Please realize this small rant is not really an I am angry rant. However, I did take small issue to losing because of matching gifts. It’s great that the company he worked for had matching gifts and pretty much anyone in his company that gave a gift doubled his total. AWESOME, yet when someone from a company team does this and basically 90% of his contributors get matching gifts, how is that fair for the rest of those who do their fundraising the old fashioned way. My total reflects one maybe two matching gifts, where as his is pretty much all of it. Matching gifts are great, no work is needed to be done other than a form needs to be filled out. However, what about those people who work their butts off doing the exact same thing, actually netting more in donations but lose out because of the matching gift. I can’t remember who I was talking to about this the other day. I think it was Tina, and she echoed my feelings. You have kids who work their butts off getting donations from family and friends, maybe doing fundraisers, selling t-shirts, collecting outside churches/schools, getting their family to get co-workers to give and doing an amazing job. Yet they end up not getting the recognition because someone else creams them with matching gifts. I realize in the end it is the funds raised, the total product that truly matters. The fact that people are so kind and generous to these causes is great and for me and others it truly isn’t about the award… But on some level it is about the award. Is it right that those who legitimately work like a fiend to raise funds “lose out” because of company teams and matching gifts??? I’m not really sure, but I had to get that small rant off my shoulders. Anyway, back to the awards dinner. I’m not gonna lie it was awkward going. I am a social person to an extent, but stick me in a room with a bunch of people and I know not a single one. I am going to have mild panic attacks. Yet I powered through it. I ended up hanging out with a nice older man for the first hour or so going through the awkward talking and conversations followed by the even weirder silences. Yet we prevailed. Later a mother, her sister, and her son joined us at the table. I was relieved because there were other people to talk to, but also this family had someone with type-1 in the mix. So there was the common ground conversation. We didn’t speak a lot at first because food was being served, but I was definitely conversation eavesdropping. They seemed normal enough, the son who was roughly 16 had had type-1 for a few years so they were talking about different things. This is one of those times as an advocate and blogger and such I was pissed off at myself. I left all of my business cards at home and stuff like that, where I really could have been doing good. So near the end of the night after the awards were given. I went over to that side of the round table and started talking with the mother and the son. It was a really good conversation. He was diagnosed a few years prior, he was MDI at the time, because as a wrestler having the pump and infusion sets and stuff like that made things difficult, even though he was a pumper, he currently was on a hiatus. We spoke about pumping for a bit, talked about some of the quirks with his Animas pump, things like that. I mentioned the different infusion sets, because that was one of his issues with the inset infusion set and sometimes having occlusion issues etc…. I mentioned the inset 30 and found out this was an option that was never even mentioned to the family. This is one of those things that I need to ramble about again. I know so many people who only know of one type of infusion set. Whether it is with Animas or Medtronic, they are sold on the one set and never even really informed about the pro’s and con’s of the different sets. Whereas the 90 degree angle is great for so many people, knowing the angled set exists for people is something you don’t know about. I used the inset and Medtronic equivalent and had so many issues with them, because at the time there was less me to attach the set to. This kept cause the infusion set to kink all the time, but once I switched to the 30 degree angle my occlusion warnings have all but disappeared. Same with the sites that just never went in and happily delivered insulin on my belly as opposed to “in my belly“. So we talked about that for a little bit. I was happy to spread information and talk about things with this family. It was great. We talked about some of the emerging technologies out there. Not limited to but including the CGM’s that were out there. Again something that they didn’t know much about, nor was it ever anything that their endocrinologist had spoken to them about. We spoke briefly about the AP and all of that stuff as well. It was great to share some of what I knew. I know the mother started talking about college and her son and some of her concerns. So we talked about that for a bit, I was acutally planning on putting her in touch with Bennet, because obviously as a parent of someone in college he would be the best person to talk to about having a son in college with type-1, but also obviously Connor himself might have been a great resource. At the end of the day, I shared a bunch of things with the family and I felt like I had made a great contact on many different levels with them. I do hope at some point they do reach out to me and ask some other questions. I left them with my email and blog and basically said this is only the beginning if you want it to be. So here’s hoping it is not just the beginning, but a great start to introducing Mom and Son into the world of the DOC, but more so giving them a chance to learn more, if they want to. I am glad I went, I guess, even though the day was a long wasted day on some level for me. The rewards outnumber the losses. I guess. So here’s hoping I hear from them. When I was in college and we tried to solicit donations from alumni, we always stressed that it’s the NUMBER of people who supported the university, and not the dollar amount. Sure, the dollars translate more into something useful, but the numbers can gauge participation, and can tell how passionate people are about the school, not how much wealth they’ve accumulated. (They always stress to prospective students that the high number of alums who “give back” reflects the satisfaction they feel towards their alma mater). It’s a shame more organizations don’t give recognition this way. We’re all passionate about fighting diabetes, and will contribute financially to the extent possible, but the ones who put forth the tireless time and effort (and are farther-reaching in the public-relations department) are the ones who get lots of donors, not just a few. (On another topic, I’ve got to learn more about the Inset-30. Someone I know is struggling with “the angled sets” (which I assume are the misnamed “Comfort” ones) and I wonder if the Inset-30 might be better).. The 90 degree angle is brutal. I can’t tell you how many either never went in or would kink or would just pull out so quickly. The slight angle is so much better. Congratulations on your award. You certainly earned it (and then some). It is true I think awards should be given for actual donations prior to matching gifts – perhaps have a second set of acknowledgments for those with multiple or large matching gifts – it does take some work to get donors to fill out the match gift forms. Alas – you did well on your own and certainly gave blood sweat and tears to get to your goals and beyond. So glad you were able to connect with the teen with diabetes. It’s hard to know what impact we have on the lives of others in moments like you shared but I would bet a life time supply of Reeses that it was a positive impact. I won’t make that bet. There is no way in heck that I am going to give up my Reese’s. That is crazy talk.